Citizens of the politically turbulent states that are New Zealands neighbours deserve better news media. A talk to an old Pacific hand. TRAINEE New Zealand journalists learn how to cover council meetings and not get sued for defamation. Their colleagues in the South Pacific learn how to cope with coups and having guns pointed at them. Now the one-time Wellingtonian who devoted a decade to training South Pacific journalists in Fiji and Papua New Guinea thinks it is time this country did something to foster the Fourth Estate in its backyard. David Robies journalism career spans 40 years, beginning on The Dominion in Wellington in 1965, but despite stints in attractive places like Melbourne and Paris and hotspots like Kenya and apartheid-era South Africa, the South Pacific became his specialty. From 1986 to 1993, he ran a South Pacific regional news service based in Auckland before shifting to Port Moresby to become a journalism lecturer at the University of Papua New Guinea. In 1998, he moved to Suva in Fiji as journalism coordinator at the University of the South Pacific. Four years later, he took a position as senior lecturer in journalism at Auckland University of Technology, where he has continued as an ardent advocate of Pacific journalism, writing a book on its pedagogy, politics and perils. Mekim Nius (Making News), launched late last month. 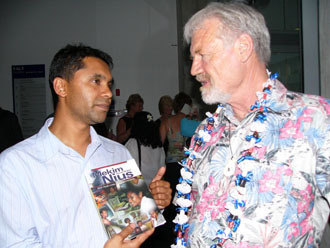 Pictured: Former Fiji political journalist Riyaz Saiyed Khaiyum with author David Robie at the NZ book launching of Mekim Nius. Photo by Sandi Eriksen. "Journalists in the South Pacific face a lot more risks than in New Zealand or Australia," he says. "Here we are concerned with defamation, but in the Pacific, you face the risk of personal threats and assaults. "One of my first students in Papua New Guinea was held up at gunpoint by a soldier because she exposed corruption in the military. At USP, we taught about dealing with sedition and treason." Dr Robie says that what happens in the South Pacific is important and often affects New Zealand, but this country does little or nothing to help train the journalists who have to work in often unfriendly environments. "We should be more involved, because the South Pacific has been a volatile area for a long time. The media is vital in strengthening democracy in the region." He cites the 10-year war in Bougainville, the three coups in Fiji, the long unrest in the Solomon Islands. "At this moment, there are rumours of another coup in Fiji and about what will happen when Labour wins the next election there, as Im sure it will." The picture he paints is of opportunities lost by New Zealand to Australia, which contributes extensively to journalism training in the region, but not of the kind that would produce the most benefit. Ausaid, the Australian government aid agency, has allocated millions of dollars since 1996 for media training in the region. "And so it dominates the region. Ausaid pays quite a lot for short-course journalism training, but its a band-aid approach with minimal training. Australias aid is designed to be influential for Australia. New Zealand aid programmes dont try to seek direct influence and favours the same way." That was not always the case. In 1975, New Zealand helped found the University of PNG journalism school, where Dr Robie worked, but though New Zealand interest in economic development aid to the region has grown, its support for training journalists quickly waned. Dr Robie notes the irony that few New Zealand journalists had any university training in 1975. Most learned on the job after starting fresh from school. A second PNG journalism school was established at the Catholic Divine Word University in 1982 and, in 1987, a journalism school was founded at the USP in Suva. But funding has always been problematic and most journalists across the region never get to them, continuing the "learn on the job" tradition. "In the South Pacific, the school system in most countries does not educate young people to question authority, so it is very important for journalists to get training in that. Outside PNG, journalists mostly go straight into the job with little knowledge of how things work. So you get some quite slapdash standards, and journalists who are wary of taking on authority." The lack of training and a tradition of not questioning authority resulted in mixed messages from the Fiji media during the attempted coup fronted by George Speight in May 2000. Dr Robie says some Fiji journalists (including those at his journalism class at the time) turned out sterling work, but others simply assumed that the elected government had been overthrown and accepted the coup as a fait accompli. Some journalists even camped with Speight at the commandeered Parliament. 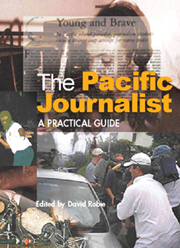 As well as lack of training, South Pacific journalists are poorly paid. In Fiji, which has one of the strongest economies and highest pay in the region, a newly trained graduate nurse begins of F$14,000 (NZ$11,700) but a journalist begins on F$6500. "What I found teaching there was that you get bright young people who will work as journalists for a year or so but leave for jobs with much better pay using the double major degrees they got to get into journalism. It means there is revolving door with a continual loss of staff and makes it very difficult to get stable editorial standards and policies." Though there are many capable, talented and courageous journalists in the region, the poor pay undermines the independence and integrity of the Fourth Estate. 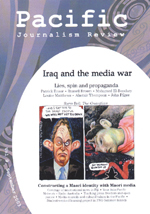 "It means that journalists are potentially more readily tempted by envelope journalism  bribery and other inducements by unscrupulous politicians and other powerful figures. There have been cases of this reported in Papua New Guinea and elsewhere in the region. And it may well be worse than is generally believed. Financial hardships and lack of training are an unhealthy mix for media in a democracy." Media owners say the pay is poor because they cannot afford anything else. Dr Robie says this might be so in smaller countries, but not in Fiji and PNG, which have some big media companies, including subsidiaries of foreign multinationals. For example, Rupert Murdochs News Corp owns Port Moresby daily Post-Courier and the Fiji Times in Suva. He would like to see New Zealand offer scholarships for Pacific journalists to come here to work as interns with our media, and establish a programme like having a New Zealand "journalist in residence at the University of the South Pacific. It isnt something he has raised formally, but he has discussed it informally with foreign affairs officials. His book floats the idea, and he hopes something comes of it. Dr Robie also believes New Zealand media could offer much better coverage of South Pacific news and issues. Despite our links with many Pacific countries and our geographical nearness, he describes news coverage as sparse. "Some things going on in the Pacific right now will have an enormous impact on the region, such as the current upheaval in French Polynesia with Gaston Flosse being ousted after two decades by anti-nuclear campaigner Oscar Temaru. But its got barely any coverage here." * Mekim Nius: South Pacific Media, Politics and Education, by David Robie, USP Book Centre, Fiji, published in New Zealand by AUT Media and South Pacific Books, $49.95.